More places to download tracks ala carte, in fact, a whole list! The tunes on this CD are played using fiddle and drum, or fiddle and bones. Beverley Conrad, on fiddle, and Luke Glick on drums and bones. Included are: Lost Indian; Rosin the Beau; Soldier's Joy and Liberty; Joys of Quebec; Jug of Jigs which includes Merrily Kiss the Quaker, Larry O'Graf and Beverley's Jig; Hills of Glenorchy; Miss Wedderburn's Reel; Loch Lomond and Flowers of Edinburgh; Big John Macneil; Bill Malley's Schottische; Bonaparte's Retreat; Durangue's Hornpipe and Sailor's Hornpipe; Farewell to Whiskey and Whiskey Before Breakfast; St. Anne's Reel and Opera Reel; Star of County Down ($12 USD + $4 shipping for US and Canada. International orders please use shipping calculator. CD package weighs about 6 ounces.) Our album was recorded with the two of us standing on a rug in a recording studio. One take. No over dubs. It's one fiddle and one drum or four bones. What you hear on the album is what we sound like playing live. The sound of "multiple fiddles" is what one fiddle can sound like when played using drones and double stops and tunings. More CD's are available at Beverley's Learn to Fiddle website! To return to this page click back on your browser. 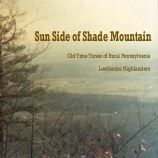 The tunes on the album are the most often requested tunes from central Pennsylvania, the area where we live. The are played on fiddle and drum, bones, spoons, and/or jawharp with no overdubs. Plain and simple. These are the tunes on this CD: Grandfather's Clock; Red Haired Boy; Waltzing Matilda; Coming 'Round the Mountain; Liza Jane - Skip to My Lou - Buffalo Gals; Swing Low, Sweet Chariot; McCloud's Reel; John Ryan's Polka - Old Joe Clark - Angelina Baker; I'll Fly Away and I Saw the Light; Arkansas Traveler; Home on the Range; Flop Eared Mule; Red River Valley; Redwing; and Shenandoah. 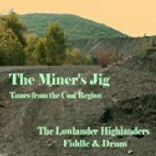 If you don't do Paypal you can buy "The Miner's Jig" at Amazon.com. CD's are $12 each and $4 shipping in the US and Canada for up to four CD's. If you're ordering from overseas figure the package to weigh 6 ounces (I don't know what that is in centigrams) and figure postage accordingly. We trust you. If you would like it signed - just say so. We'll be happy to do so! 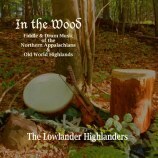 You may preview longer samples of In the Wood and The Miner's Jig at CDBaby! There is no need to sign up, register, login or anything else like that at our CD Baby webpage. Just click on the sound samples and you get a full 2 minutes of each track so you can hear what we sound like. "Simplicity is the key! This duo is just taking us back to "Colony Days" and nothing could sound better to lead your imagination to a time when all was in the making and that "all" stands for America. If all that glitters can't be gold, all that doesn't might hide a nugget.The music talks for itself: it's genuine, unpretentiously rich with centuries of history as its background and honestly looking as young as a rose bud in April. If you are a disk jockey or operate a radio station and would like a complimentary copy of any of our CD's, please contact us by email, snail mail or phone and we will send you them to you. Please include the call letters of your station, name of your show and your name and mailing address.